FOR IMMEDIATE RELEASE – GREENWICH, CT, May 9, 2016 – Chief Executive magazine released its annual Best & Worst States for Business survey and CEOs again rated Texas as the No. 1 state in which to do business. No. 2-ranked Florida continued to steadily edge up in the qualitative measures. North Carolina, Tennessee and Indiana also made the top five. Ohio ranked as the biggest gainer, rising from No. 22 in 2015 to No. 10 in this year’s survey. The Best & Worst States for Business survey captures the sentiments of CEOs on a range of important issues. The rankings are crucial, as CEO sentiment drives investments in offices, factories and other facilities that bring jobs to a region. 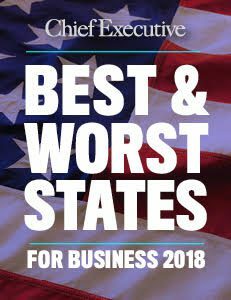 In addition to the overall state rankings, Chief Executive’s 2016 Best & Worst States for Business survey also presents individual category rankings, including quality of life, tax policy, workforce quality and best communication of business incentives, as well as rankings by region. 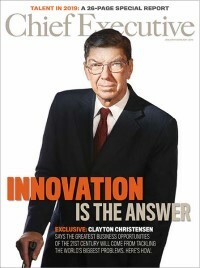 Chief Executive Group produces Chief Executive magazine (published since 1977), ChiefExecutive.net, and conferences and roundtables that enable top corporate officers to discuss key subjects and share their experiences within a community of peers. The Group also facilitates the annual “Chief Executive of the Year,” a prestigious honor bestowed upon an outstanding corporate leader, nominated and selected by a group of peers.